Home Ecommerce Platform Should You Have a Mobile Version of Your Ecommerce Website? Do you think Google search results will ever return different results based on the device (PC or smart phone) that the person is using? i.e – if a person is using an iPhone, and searched for widgets, will widget websites written for smart phones do better in the results list? How do you think these scenarios will affect SEO? Do Search Engines Deliver Different Results to Mobile Phones? Google has a patent that describes how a mobile algorithm could show results based on the users location, the time of day and their previous history. For example if you opened up Google at lunchtime it would display a list of phone numbers for your favourite local pubs before you even had to search for anything. Opening up Google in the same location at midnight would bring up a list of local taxi firms and pizza shops, again without you having to search for anything. Mobile algorithms are going to become more and more behavioural based as Google extracts more data from our mobile search habits. The key to ranking well in these algorithms is going to be very similar to the current online methods of ranking in Google Local. Do Search Engines Favor .mobi Sites over .com? No, Google displays a mix of results (mobile versions and regular versions) through mobile search. 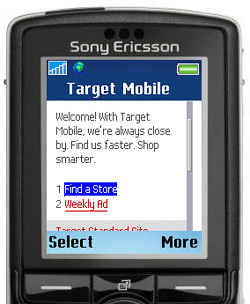 In the past you could switch between its mobile-site-only index and blended results, but apparently this ended in 2007. As mentioned, Google Mobile Search has its own algorithm which is rumored to favor local searches (based on wi-fi location, GPS and cell ID location) and current content (right-now searches like news and local business listings vs. Wikipedia entries, for example). It may also involve mobile search user-behavior data (click through rates and time on site) to determine relevance (bounces due to poor user experience, for example). 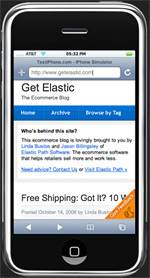 What’s the Best Approach to Optimizing Your Site for Mobile? “Is .mobi dead?” was a hot topic at Search Engine Strategies San Jose this summer, and thanks to livebloggers like Bruce Clay’s Lisa Barone and Search Engine Roundtable’s Carolyn Shelby, we have online summaries of Cindy Krum of Blue Moon Works’ 4 alternatives for marketers confused about how to approach the mobile Internet. Always an option, and a good choice if your site already renders well on mobile phones. Test your site using the “Big 3” engines – Google, Yahoo and MSN, and on different smartphones (older phones vs. newer phones, etc). “If it’s reasonably legible, it’s probably not worth the extra effort.” You can 301 (permanent) redirect your .mobi domain (if you have one) in this case. Cons: Transcoding only works when your site is accessed through search. If someone clicks on a link through email, for example, the user experience may not be as good. Plus, URLs get messed up by transcoding so it’s harder for users to bookmark your URLs and you won’t get backlink credit. Design mobile-specific that are narrower, have less functionality, simpler navigation and smaller images. Redirect visitors to the mobile version based on device detection. Requires a subdomain like m.site.com or site.mobi. Pros: Simply update code that already exists. Cons: Your homepage needs to “work” on mobile browsers anyway, and an extra click is required to access your mobile version. It’s also double the maintenance – an update on your .com requires an update on your m.site.com or site.mobi (whatever you’re using). Use your existing content, but create a CSS version for mobile (or multiple CSS designs for different mobile browsers). Pros: Simply add another style sheet. No duplicate content problem because it’s just rendered differently as the browser pulls the sheet automatically. Cons: No guarantee the browser will pull the right style sheet. And lots of work if you’re not already using CSS. Combine your content database with user agent (desktop vs. mobile) detection to transcode the site on-the-fly. You can target devices based on make, model and operating system. Pros: Best option if you want to offer the best user experience and leverage your SEO efforts. Cons: Expensive, requires custom coding. Also a short term solution since you need to re-do it with every new software release and new make/models of devices. More difficult to implement. What Are the Implications for SEO? Whenever you have duplicate content (a .com version and a .mobi copy, for example) you risk splitting your back links which can affect your SEO. (Plus you have to maintain and promote 2 sites). If you opt to ditch your .mobi version, make sure you do a 301 redirect from .mobi to your regular domain so you combine back link credit. There are also no tools to check your mobile rankings, so from an SEO reporting standpoint, there’s a lot of gruntwork to keep track of it (not that I think this really matters). Because Google exhibits no preference for a mobile version vs. a transcoded version, your decision needs to be made based upon how it currently renders on various mobile devices, the monetary and human resources you have today and in the future, and the importance of mobile to your business right now. Personally, I’d use device detection to display the same URLs differently on smart phones. Most people using smart phones will still use Google, Yahoo, or MSN search – not mobile search engines! This means the most relevant pages of a web site will be found, not those most appropriate for the device. So, even if you create new pages, sub-domains, or even sites for different devices, those aren’t likely to be the pages found in the search results … the existing site pages are –relevance over device type. Longer term as Google continues to incorporate user behavior patterns into the reordering of search results, it will begin to consider the source of the search as well (ie. mobile device or desktop). Pages showing more favorable user behavior stats in response to search queries on mobile devices will begin to rank better for future searches from mobile devices. This of course means, device detection becomes much more important yet! SEOs will then have to worry a great deal more about managing devise specific user behavior, and not just user behavior in general. insignificant. If Google or any search engine, were to start giving that small handful of sites a boost it would damage their relevancy. If you are dead set on moving forward with a mobile version of your website, give you users the option to go back to the standard version of your website if they choose to. Most mobile websites are stripped down and lack features of the regular site. My iPhone will render your regular site so let me go there if I want. Also consider that the most common use of the mobile web is email. When you send retail email offers, there’s a good chance your recipients are receiving them through their mobile devices. Having a link to a mobile version of your email creative and your online store may be effective, since once a message is opened, if it’s not bookmarked or marked as unread – it may be forgotten (unless it’s really remarkable). Another consideration is what is the primary reason customers access your site? 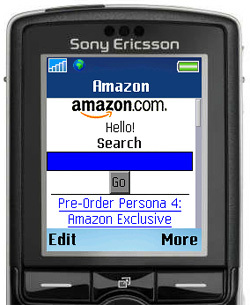 If you’re a pureplay online-only retailer, you might want to design your mobile site like Amazon – with a search box front and center. If you’re Target, it may be more helpful to link to a store locator or flyer. To learn more about mobile commerce for retailers, do catch our on-demand webinar with Bill Mirabito of B2C Partners: Holiday Wish List for Mobile Commerce.